Mark Fine, though I wish I had a few more syllables in my name. I envy your four: Fi/ona Mc/vie. Born in the City of Gold—Johannesburg, in faraway South Africa. I now live in sight of Catalina Island, south of Los Angeles. I’m a veteran of the record industry; worked with wonderful artists like Sheryl Crow, Boys II Men, Bon Jovi, and Bryan Adams. It was tremendous being around such creative artists, on a daily basis, and help them achieve their creative aspirations. Unfortunately, my late wife was diagnosed with breast cancer. I quit my music gig to care for her, and raise our two boys. Frankly, I surprised myself at how well I took to becoming ‘Mr. Mom’. In reflection, the most rewarding mission of my life. My sons have really prospered. The elder is a real rocket scientist at SpaceX. The younger is conquering it at business school. Both grateful and proud. Thankfully, romantically speaking, life has afforded me a second chancewith a wonderful soulmate. 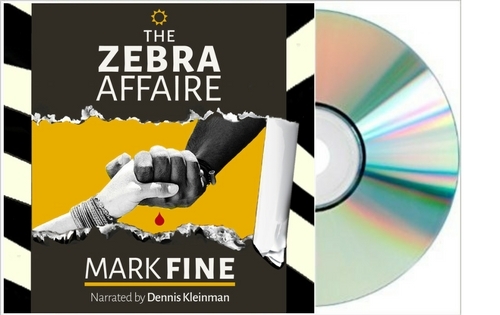 I just released the audiobook for The Zebra Affaire on Audible.com. For someone who spent a major part of his career in the recording studio, it’s odd it took me this long to co-produce this recording. Almost 10 hours—unabridged. Truthfully, I needed a voice actor with South African roots to do the narration. 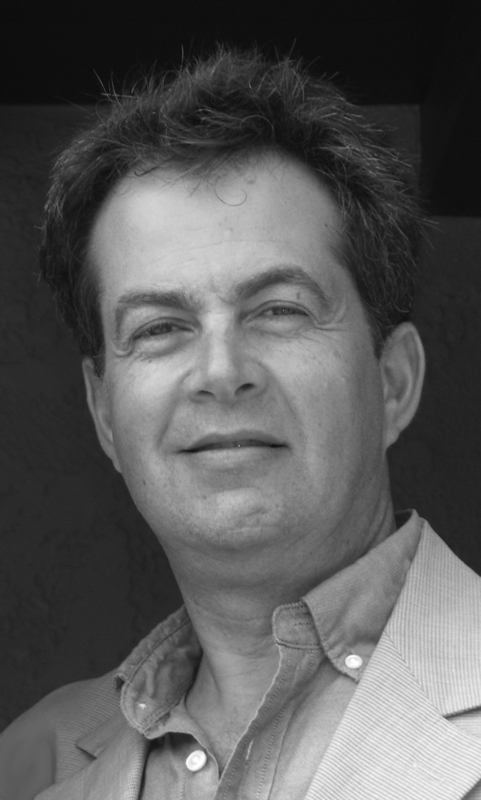 When I chanced upon the talentedDennis Kleinman, everything then changed; I had no excuse to not move forward with the audio project. Dennis is familiar with the dialects and colloquialismsthat make The Zebra Affaire so authentic. And for the listener—through my words and Dennis’s voice—Elsa and Stanwell’s struggle to preserve their forbidden love against extraordinary odds (the full force of the apartheid regime), is vividly brought to life in this audiobook. Every author should treat themselves to the tremendous experience of hearing their book read back to them by a gifted narrator. Dennis Kleinmancertainly did that for me. The way he seamlessly transitions from character to character, by adding his personal vocabulary as an actor to my plot, is extraordinary. An outstanding performance! This week, I also published a small folio of short stories. 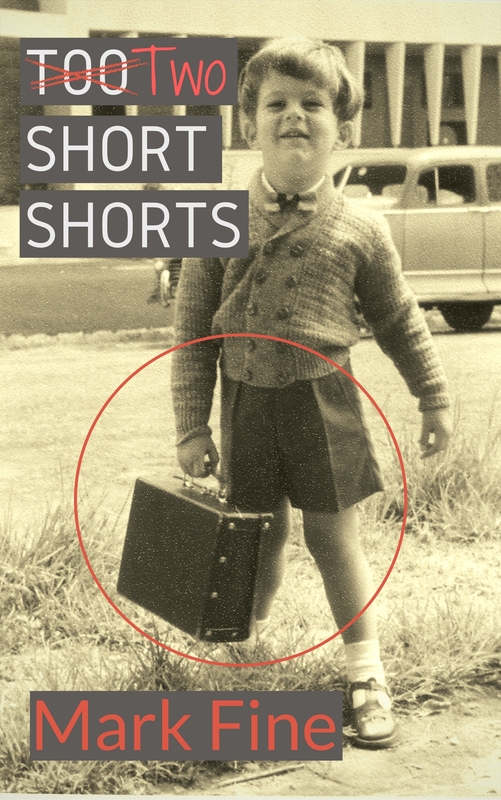 It’s titled Two Short Shorts: Short Stories of Strangers in Strange Lands.Though the book cover is an ancient picture of me, as a little tyke, wearing embarrassingly short shorts, it is not at all biographical. However, it is a commentary on being a ‘square peg in a round hole’ which I personally find relatable. The moment someone else read my words;and that these same words resonated with them, challenged them, made them weep, made them angry, and compelledthe reader care for the characters I had created. My paternal grandmother ran a library. Hence, I always admired the printed page. The next step was deciding which story to tell. It took time and distance—from the country of my birth—to better understand the complicated social dynamics there. It is not simply a black and white story. But I could see patterns begin to repeat themselves here in the United States and elsewhere, so I felt The Zebra Affaire could serve as a cautionary tale. 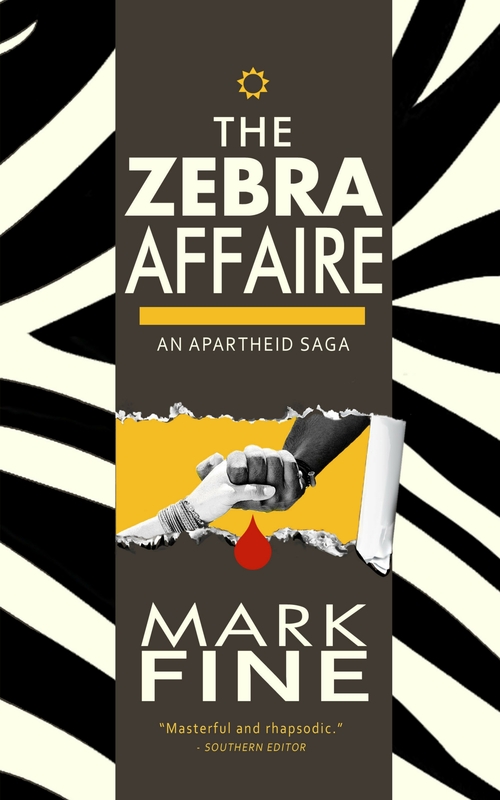 “The Zebra Affaire” speaks of a forbidden romance across the color divide in a malicious, racist society. Elsa and Stanwell’s affair was not only socially unacceptable, but it was illegal—with seven yearsimprisonment as a consequence of being discovered by the authorities. However, stepping away from bigoted manmade laws, whether black or white—we are all truly equal—as are the black and white stripes of a zebra. I’m a patient writer. Research is a key element. It may elongate the writing process, however, the knowledge I gain is well worth it. Better still: I’m the vehicle that transfers that same knowledge to my readers—but in a far more entertaining way. It is satisfying, when I meetwith a book clubs, to find The Zebra Affairehas past the Google test. Nowadays, it’s so easy to be fact checked that I do my best to be a diligent researcher. The canvas on which I paint the lives of my characters is totally realistic. I guess 1976 South Africa isn’t quite long ago enough to be categorized as Historical Fiction, but setting the apparent ‘youth’ of the period aside, the book has all the bones, and authenticity, of historical fiction. As I was raised during those torrid times, there are certainly echoes of my personal experiences throughout the novel. No doubt. The grand finale in Zebra is a safari sequence. I used that as an excuse to go on safari; a field trip to the magnificent, Londolozigame reserve. With camera and pen, I documented the setting and behavior of animals, humans, location and weather, in order to bring a heightened sense of immediacy to my writing. I’m a big believer of exploring our full senses in storytelling. I needed to hear the chuff of a lion, smell the char of a brushfire, feel the grit of the parched earth, taste the organic nature of a rustic meal, and see the splendor of an African night sky—unspoiled by big city light pollution—to better articulate these pure moments for my reader. I did. Not that it was my intent. As a remedy for writer’s block; rather than walking away in frustration, I chose to change my creative focus. Rather than struggle to get twenty-six letters to march in cogent order, I pivoted to pictures, graphics, fonts, and layouts. I taught myself Photoshop, thanks to YouTube, and almost organically designed the cover as the book’s manuscript was shaped. Yes. The only up-front way to fairly evaluate the world around us, specifically people, is on the basis of merit. As guiding criteria, merit, is inherently colorblind, nor is it swayed by creed, race, gender, tribe, religion, etc. Also, merit is contextual. You do not apply the same metric to both subsistent farmer and billionaire. From personal experience, frankly, merit was the only sane way to navigate through the arcana and social distortionof the unfathomable, cruel apartheid laws. Merit sweeps away the emotion of ideology, the prejudice of fear, and the foolishness of ignorance. In an imperfect world, merit is the purest way I have found to deal with folks on a person-to-person basis, without preconceived biases. That said; merit expects everyone to contribute to the greater good, to the best of their individual ability. To some that may seem harsh; to me it is both fair and dignified. Similar to the record biz, with its vibrant Indie Scene, I feel the publishing world has a comparable pool of extraordinary emerging talent. I’m a fan of Elizabeth Horton-Newton (The View from the Sixth Floor), Julie Mayerson Brown (The Long Dance Home), Geoff Nelder (Aria: Left Luggage), Eric Gale (Outsourced), Jack Kregas (Choice Cruise Lines), Jean Gill (Song at Dawn). Perfection, and the pursuit of it, is so costly—both in emotions and treasure—that I have learned to let go. Nevertheless, I do regard my books as living documents. The process of producing the audiobook was most informative; I found I had to tweak some of the dialog sequences to make them more natural for the narrator to articulate. Stanwell should be played by Boris Kodjoe. Margot Robbie would be my definite to embody Elsa. Write your ending first. It may seem counter-intuitive; however, consider it to be like a lawyer’s closing argument. Everything that happens before leads up to that dramatic wrap up at the end of a court case. Switching to another metaphor, by knowing your destination, you increase your odds of getting there in one piece. Your early draft of the book’s conclusion is like a sign post guiding the way. Of course, go back and review your closing, tweak, then repeat; especially as your writing muscles develop, thefurther you get into your WIP. I am deep into my next novel; it is an interesting collaboration. If songwriters can collaborate, why not authors? Again, the focus will be on Sub-Saharan Africa, though it will be a decade later than the 1976 setting of The Zebra Affaire. Our working title is “The Spy in the Hyena Den”. Herman Wouk, “Winds of War” is the first significant book I read. Animals. I weep for the countless rhino and elephant slaughtered for their ivory and horn. Tragic waste; these magnificent creatures killed for mere trinkets and problems better solved with a certain blue pill. Yet, watching baby elephants trying to learn to use their rubbery trunks for the first time is the funniest thing, ever. Winston Churchill. Supreme writer, orator, statesman, and blessed with an extraordinary gift of foresight. Philanthropy.Especially wildlife conservation and breast cancer research. ‘So Little Time (So Much to Do)’: the title of a 1938 Louis Armstrong song. You’re paternal grandmother ran a library? No way! If I were in your shoes, I would have hung out with my grandmother every day of my childhood. I’ve always loved reading and I still love reading to this day. I’ll have to check out your book from my local library the next time I stop by there. Keep the interviews coming, Fiona! Maddie, I certainly did hang out with my grandmother, all the time. My father was a single dad, so Granny Minnie played a significant role in my life. She is acknowledged in a backstory within “The Zebra Affaire”. An appropriate homage to the woman who blessed me with the joy of reading (and so much more). Thanks for being in touch. What are your favorite books?